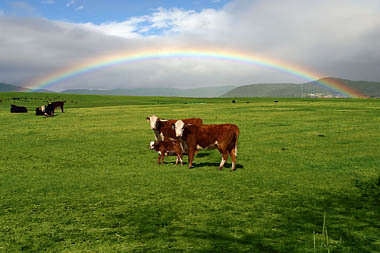 Cascade Organic Beef is a family owned and operated ranch located in the towering Cascades Mountains and the Klamath Basin. Since 1910 we have continued to ranch in the old time traditional way and have maintained lands that are Certified Organic by Oregon Tilth since 2000. Grazing on this land is our mother herd. This has been a “closed herd” with no other animals introduced since 1924. The only exception has been new bulls brought in to maintain healthy genetic diversity and herd vigor. With our meticulous record keeping and breeding programs we confidently offer you the most wholesome and best grass fed/grass finished beef you may ever eat! Our Angus/Hereford cross cattle are solely raised by us, graze on premium organic grasses from birth to the market, and never leave our personal care. Thus the consumer can have full confidence that the product they purchase is truly “Premium Organic Beef” proudly raised by our family and the cowboys of Cascade Organic Beef, LLC. We are a wholesale, ranch direct company. More information is on our "Products Page". You can also read our history and more in the "About Us" section. Please feel free to contact us anytime for any questions you might have.